I read an article titled “Philippine Government Increases Infrastructure Expenditure to 5% of GDP in 2014 – Is This Enough?” and realised that Civil Engineering is a good course of choice. The Philippine Government has earmarked $9.24 billion (3% of GDP) for infrastructure spending in the 2014 budget. Now, this is only as far as Philippines is concerned. Read this article “Why Infrastructure Management is Important“, and you will notice how much the countries in regions of the world will be spending annually for infrastructures. According to the World Bank Infrastructure Strategy Update chart, the annual infrastructure spending of some world regions is 7% of GDP or between $45.3 to $207 billion dollars. Also, with most developing and third-world countries struggling for integrity, the World Bank would be needing honest and skilled civil engineers who would supervise all these infrastructure program implementation around the world. For all the infrastructures these countries will be building as they cope with population and development, the role of infrastructure management or infrastructure asset management experts are valuable. CLICKING on the image below will direct you to a post that will provide snippets of infrastructure management learning in the Philippine context. Study at Central Philippine University. This is article is the second part, which covers the top 5 of 10 popular tourist destinations of the world. Travelling can mean differently to people. For some it is a necessary part of work, a lifestyle for some, and for most of us a luxury or a treat. It is almost a single activity that engages all our senses. Visiting beautiful places has never been as accessible and affordable as it is today. Thanks to breakthroughs in science and technology. Modern transportation has made travelling fast and safe. Here are the top 5 of the 10 most visited tourist destinations in the world. No wonder this country is called Bel Paesa or beautiful country. Its annual visitors of 43.2 million come to Italy for its fine art, history, fashion, and culture. With most of the world heritage sites, Italy has drawn more history lovers from all over world than any other countries. Don’t forget Italy is the home of delectable pizzas, pastas and gelato which are gastronomic treats for the so inclined. Rome, Venice, and Florence are its famous cities of Art. Italy also has its share of scenic coasts, mountains, and lakes. 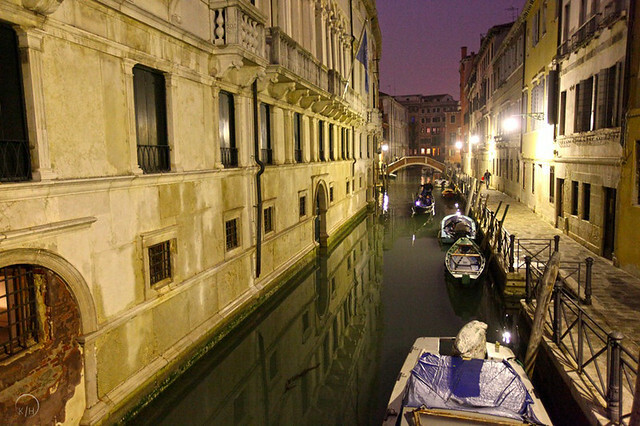 Topping its tourist destination is the beautiful Canals of Venice, the crown jewel of water cities. China boasts of 50.9 million tourist each year despite becoming more known as controversial economic giant. Since the beginning of China’s reform and opening over the last few decades it has seen expansion in its tourism industry. What contributes to its tourism boom is the country’s increasing middle class and the government’s loosening restrictions of movement. The Great Wall of China is still its hottest tourist destination. People from all over the world just love to visit this ancient wall. With an annual visitors of more than 52 million, Spain seize the Top 3 tourist destination in the world. Spain used to be a popular summer destination for visitors from Portugal, Central Europe, the British Isles, and France. Spain’s most visited city is Madrid and Barcelona people come here for various reasons most notably for entertainment, fashion, sports, and the arts. Running of the Bulls, is one of the most popular events in Spain that attracts millions of tourists. It is held annually in Pamplona a city in Navarra. The San Fermin festival is celebrated every year from July 6 to 14, where running with a dozen bulls is the climax of the festivity. The US boasts of more than 54 million tourists each year but it covers 50 states. Where does one starts when traveling to the United States? Each state seem to have its unique culture and distinct experience to offer. The United States is melting pot of various cultures and thus, contributes to its diverse cities and attractions that are a challenge to narrow down. The best advice for a tourist or traveller is to travel by instinct or go with the crowd. Topping the charts for its most visited city is unsurprisingly the Times Square in New York City. After this, there are still hundreds of places to see and experience around the states. Depending on what you dig, America has it. From the bright neon lights of Las Vegas with its bouncy night life to the tamer and benign pleasures of Disney World’s Magic Kingdom in Florida. If you’re into history and sciences then there’s the American Museum of Natural History in New York City. There are so many and much to see and do in this country. So prepare to stay for longer time to cover more ground. France have more than 74 million visitors each year. Its most popular destinations are Paris, French Riviera, and Provence. A visit to Paris the capital city of France is incomplete without going to the Louvre, a most visited art museum in the world. Of course there is also the Musée d’Orsay and the Beaubourg equally popular stopovers for the art enthusiasts. The French Riviera boasts of 115 kilometres of coastline and beaches, 18 golf courses, 14 ski resorts and thousands of restaurants. Getting 300 days of sunshine a year it attracts more than 10 million tourists per year. This is a haven for those willing to pay for the finer things in life. For nature lovers or travellers looking for a break from a bustling urban scene Provence is just the right place. The Gorges du Verdon and other natural parks provides a laid back provincial feel and historical sights. There you have the top 10 international tourist destinations. Brief descriptions of each destination are just teasers meant to whet your appetite for travel. The world is a mystery and an adventure waiting for you to explore. Again, these top 10 tourist destination share one thing in common. They invest on building infrastructures to cater to millions of visitors each year. To ensure that infrastructure outlay are best spent and quality edifices are put up, one could just wonder if their government implements a comprehensive infrastructure management scheme considering that the tourism industry is there to stay. Perhaps one could ask, does each country have effective infrastructure asset management program so that both its citizen and tourists are using efficient and well-maintained infrastructure? Whether you are a seasoned traveller, a hesitant one, or still daydreaming about your first adventure this article will be helpful to you. Travel can mean differently to people. For some it is a necessary part of an occupation or career, some as a passion or hobby, while to others or most, a luxury. When I was a child, I used to hear people say that the cheapest way to travel is by reading books. Now, there is another way to do it. In the safe and comfort of your house, with just a computer and internet connection you can travel the world through Google earth or Google maps. Think about this, a couple of decades ago maps as we know it were just the outline of the landmass and countries on a flat piece of paper. Well, except maybe for some government intelligence agency where satellites orbiting in the exosphere some 130 miles from earth are used to explore an area or country of interest. Anyway, nothing is more exciting than real travelling. Planning your trip and charting your course are activities that could heighten and engage all the senses. Whether you’re travelling in your imagination or looking forward to a trip around the world, here are the Top 10 Tourist destinations of the World. With some 21.5 million visitors each year Mexico has the no. 10 spot as the most visited countries in the world. Its ranks second of the most visited country in the Americas just after the USA. Tourists are attracted by its Meso-American ruins, colonial cities, cultural festivals, and beach resorts. The peak tourism season is in December and summer months, particularly before and during the Easter when lots of colourful festivities are taking place. Spring break visitors are mostly students from the United States and Canada heading out to the beautiful beaches to chill out from school. Majority of visitors are from the US and Canada and some from European and Asian countries. A small portion of tourists are from their neighbouring Latin American countries. Affluent and middle class Mexicans also prefers to spend holidays in their country while some middle and higher class travel overseas. With a yearly 23.6 million visitors, Malaysia’s tourism capitalizes on its diverse culture, beautiful and eco-friendly holiday destinations. One of its most popular attractions is the Petronas Twin Towers, an 88 storey building, which at present the tallest twin tower in the world and a picture of modern architecture. The country’s promotional effort in 2006 which initiated them to sign a deal with Manchester United worth 2£ million for “Visit Malaysia Year 2007” tourism promotion and prior to that a successful deal with Chealsea Football Club, a top tier English football based in Fulham, London had enormously bolstered Malaysia’s tourism. According to Travel and Tourism Competitiveness Reports, Germany is among the top safest travel destinations in the world with over 24.2 million yearly tourist to boast. Majority of visitors hails from the Netherlands, United States, and Switzerland. Germany is at the heart of Europe, historically visitors come for academic and recreational purposes. Now visitors are still fascinated by the country’s architectural treasures and fascinating places of natural beauty. 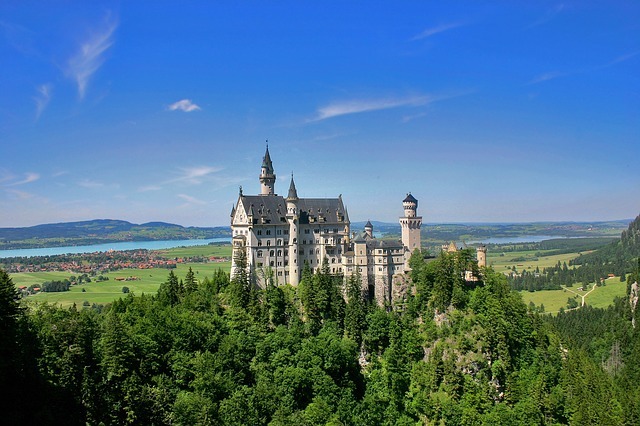 Its number one tourist destination being the Neuschwanstein Castle, Germany’s fairytale castle famous for its romantic architecture and for the tragic story of its owner. It might be the Turkish seaside resorts along the Aegean and Mediterranean Sea and its various historical sites that is responsible for its 25.5 million tourists per year. Most of its visitors come from Germany, Russia, UK, Netherlands, France, Italy, Arab World, and Japan while some are from the Northern Americas and Scandinavia. Istanbul is its most popular tourist destination featuring several mosques, colourful bazaars, and Turkish baths that can keep busy throughout your trip. Their rich and colourful carpets in the bazaars grabs your attention as well as the common haggling over one before a purchase. There are so much to do when visiting this country, the list just goes on and on this is probably one reason why the 28 million tourists can’t get enough of Britain and just had to go back each year. One way to go about your trip is to visit huge old castles rich with history and legends. There are world-famous gardens that begs your attention and time as well. UK’s dynamic arts and culture evident in the architecture of buildings, bustling markets, idyllic countryside, and just in the everyday life of its residents is an attraction itself. So what makes these countries very popular to tourists? Is their famous sites the only factor? Would you consider facilities, accommodations, food and friendly people contributing to their popularity? A common factor among these top tourist destinations is there infrastructure in place, how the old and new infrastructure blend together is art and evidence of very satisfactory infrastructure management in place. Know the Top 5 International Tourist Destinations in the world in part 2 of this article. If you have studied and lived in Iloilo City, particularly at CPU, then I’m sure you have experienced the flood that’s been as perennial as when the rainy season comes. When monsoon rains come, students anticipate the coming of the flood because they’re sure the Jaro River will overflow. Classes would then be postponed for a day or couple of days depending on the amount of flood waters, debris and how fast the clean-up would be. When there were few people around Lopez Jaena area and surroundings were cleaner, students just love to wade and walk the flooded streets and inside CPU campus. The familiar flood scene would then be some female students wearing their shortest shorts walking while male students at their best spot watching and talking who’s got the hottest legs in campus. It’s not advisable to do that nowadays. The clogged drainage, old and leaking sewer and sewage systems (if there’s one), bad waste disposal and waste management practices make wading into the flood unhealthy and could even be fatal. Through the years, Lopez Jaena Street is not only beset with flooding that occurs annually (or biennially) courtesy of the monsoon rains. The last time I was in the area, waste water seems to flow continuously onto the street from homes and business establishements. Also, a few minutes of raining would cause flooding in several portions along Lopez Jaena Street. I hope that the situation had changed. 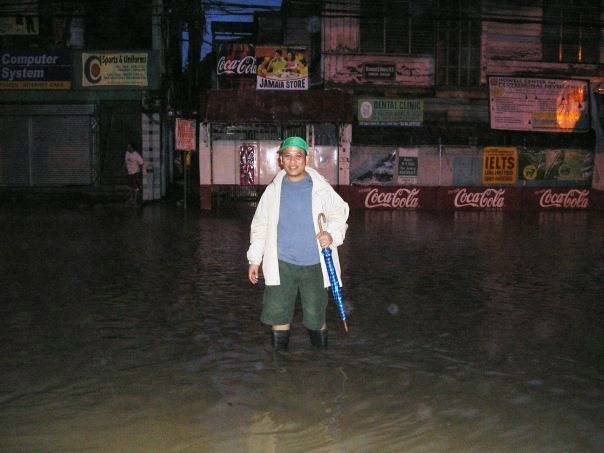 Checking the water level during the August 2009 flood. Storm sewers are either dysfunctional or having been designed and constructed decades ago, it can’t convey the amount of runoff anymore. At the onset, had the city government instituted water utility infrastructure management, they could have built the infrastructure design that meets future changes in population and public needs. CPU student enrolment grew from 9,132 in 1997 to 13,506 in 2005. From then on, student population never went below the 10,000 mark. The 2013 enrolment is 13,000 students. Of course, this is discounting the resident population along Lopez Jaena Street and across the Jaro river bank, which could number to several thousands. Along with the growth of student population, hotels, dormitories, boarding houses proliferated. Eateries, convenience stores and business establishments along Lopez Jaena Street have become the dominant sight. Just imagine the implication of these two factors in water needs and waste water volume. Perhaps decades ago, when there were more open spaces and a few hundred people living around CPU, our city infrastructure management services engineers should have given weight on the future changes. Maintenance or even renewal of infrastructures could have been quite manageable fiscally and structurally. Now, it would cost millions to construct and update the present sewer and sewerage system along Central Philippine University and Lopez Jaena. Also, following best infrastructure management practice, holistic and not piecemeal solution to infrastructure problems must be emphasized. Infrastructure management engineers might not recommend fixing the infrastructure challenges along Lopez Jaena Street and CPU areas without thinking of its implication to the total system of Jaro District in particular and Iloilo City in general. Nevertheless, it’s not yet too late to get infrastructure management expert counsel save millions of infrastructure funds.